This is an edited version of an address delivered by Senaka Weeraratna, Hony. Secretary of the German Dharmaduta Society, on September 28, 2016 in support of his resolution entitled ‘Recognition of Buddhism as an official religion in non – Buddhist countries’ at the First Plenary Session of the 28th General Conference of the World Fellowship of Buddhists (WFB) held in Seoul, South Korea from September 26 to 30, 2016. The WFB being the leading international Buddhist Organisation, was founded by a great visionary, Dr. G.P. Malalasekera, in 1950 in Colombo to unite all Buddhists despite glaring ideological differences among the various traditions, under the umbrella of ‘Fellowship’. There were 129 Buddhist delegates from 27 countries representing Asia, Europe and North America (including Hawaii) at this historic meeting which saw the founding of the WFB. It is now generally accepted that this meeting marked the first event in Buddhist history when Buddhists (laity and Sangha) of nearly all sects in the globe were duly represented. Among the notable figures present on this occasion was Dr. B.R. Ambedkar, the then Minister of Law and Chairman of the Drafting Committee of India’s Constitution (also known as the father of India’s Constitution and regarded by some as the ‘Modern Manu’. More importantly he was greatly instrumental in the revival of Buddhism in India in the modern era being the leader of India’s Dalits (so-called untouchables) who converted to Buddhism. On 25 May, (1950) he ( Dr. B.R. Ambedkar) arrived in Colombo by air with his wife and Rajbhoj and the same day attended the inaugural meeting of the World Fellowship of Buddhists at the Temple of the Tooth in Kandy. 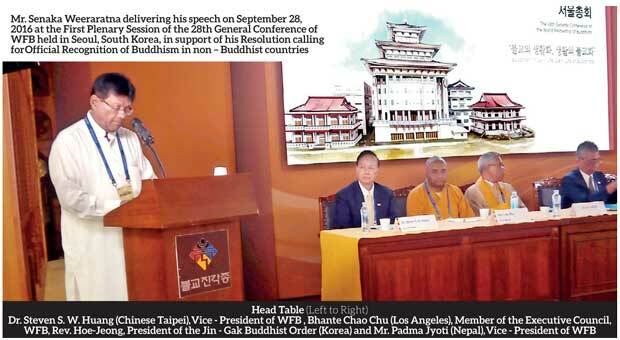 Since he was not attending the meeting as a Delegate (for that would have implied that he considered himself a Buddhist), he declined to speak at the official session and, instead, addressed the delegates after they had adopted the resolution inaugurating the fellowship. There were people in India, he told them, who thought that the time had come when the effort might be made to revive Buddhism, and one of the objects of his visit was to observe Buddhist ceremonies and rituals, which the people of India had no means of witnessing. Having thus explained the purpose of his visit, Ambedkar turned to the conference itself. He was not fully satisfied, he said, with the resolution that had been passed calling for a World Fellowship of Buddhists. What was wanted was a declaration on the part of all the Buddhist countries that they were determined not merely to have a Fellowship but that they would propagate the religion and make sacrifices for it. Whether the delegates realized it or not, what Ambedkar was really saying was that the Buddhist countries of Asia should be less inward-looking and more outward-looking. He himself was, as usual, sufficiently outward-looking. After the conclusion of the inaugural WFB conference, Dr. Ambedkar not only saw as much as he could of the ceremonies and rituals of Buddhism in Sri Lanka,but found time to address the Young Men’s Buddhist Association, Colombo, on ‘The Rise and Fall of Buddhism in India’. Buddhism had not totally disappeared from India, he asserted. Though its material form had disappeared, as a spiritual force it still existed in India and commanded respect, he said. Suitable evidence of acknowledgement of major Buddhist influence in Indian History, is the inclusion of the Asoka Chakra being a depiction of the Buddhist Dharmachakra which appears at the centre of the Flag of India. It also appears on a number of Edicts of Asoka most prominent among which is the Lion Capital of Ashoka. Dr. Ambedkar’s advice to the WFB was that it must not confine itself to mere ‘fellowship’ but instead WFB must be forthright and determined to make sacrifices in fostering (and protecting Buddhism), and have an impact on the unfolding major events in the world. Today, there are threats even to the sanctity of the Maha Bodhi Temple at Buddha Gaya. It is subject to constant disturbance from sound amplifiers i.e. loudspeakers, installed at a nearby Mosque situated only 60 metres away from the Maha Bodhi Temple. The tranquillity and serenity that one associates with the most sacred place on earth for Buddhists i.e. place of enlightenment of the Buddha, is not possible due to management of the Temple not being under the control of Buddhists. It is tantamount to humiliation of Buddhists to be forced to listen as a captive audience to shrieking sounds in a foreign language amplified many times over in the most sacred site for Buddhists. The Govt. of India which has taken special steps to attract tourists from all over the world to visit important Buddhist sites in India must address this issue on an urgent and serious footing without any further delay. WFB must add its voice and urge the Govt. of India to act effectively to put a stop to highly amplified sounds of another Religion that disturbs the tranquillity and calm of the main Maha Bodhi Temple at Buddha Gaya. The resolution before this House is a call to the WFB to lobby the international community to extend official recognition to Buddhism in countries outside Asia. It is estimated that there are now altogether between 1 and 4 million Buddhists in Europe, the majority being in Germany, Italy, France and the United Kingdom. Despite a commitment to ‘multi-culturalism’ and ‘religious pluralism’ in Europe, the official recognition of Buddhism is confined only to two States i.e. Russia and Austria. In most Islamic countries in West Asia, the existence of Buddhism as a religion is denied because it does not subscribe to the belief in a creator God. This translates itself into denial of any form of freedom of worship, including access to places of worship for Buddhists in the Middle East despite over one million expatriate Buddhists working and living in these countries. In some Islamic countries, including Maldives, Buddhists are not allowed to enter these countries with books on Buddhism or any artefact that resembles affinity or respect for Buddhism, such as Buddhist statues. In some airports they are pulled out from the possession of the foreign visitor by customs officials and dashed to the ground. This is a clear violation of a fundamental human rights. The right to choose one’s religion and practise it. Many international bodies, including the UNHRC, are complicit tacitly in such human rights violations through conduct of omission and deafening silence. However, in contrast to the practice of countries in the Middle East, several Islamic majority countries in South East Asia i.e. Indonesia and Malaysia, and South Asia, such as Bangladesh have given official recognition to Buddhism and declared Vesak as a public holiday. Pakistan officially recognizes Buddhism and held the first ever Vesak Festival organized by the Government of Pakistan at Taxila commencing in year 2016. In Europe, so far only Russia and Austria, have granted official recognition to Buddhism, despite Buddhism being one of the oldest religions and accepted as a global religion by the UN which has allocated a special day in its annual calendar for celebration of Vesak (Buddha’s birth anniversary). The non-recognition of Buddhism as an official religion in Europe has led to discriminatory treatment such as categorizing Buddhists as being members of ‘sects’ and ‘cults’ among other things. The absence of State recognition to Buddhism in almost all European countries functions as an impediment to the proper practice and development of Buddhism in Europe. There are no public holidays for Buddhism or any other non-Christian religion in the public holiday calendar of European nations with Christian heritage. This is in stark contrast to the conduct of traditional Buddhist countries e.g. Sri Lanka, which has granted public holidays on days of religious significance to adherents of both Abrahamic and Eastern Dharmic religions. Even UK denies official recognition to Buddhism. It does not allow the construction of new Buddhist Temples. But allows Buddhists to occupy existing buildings and use them for their religious functions. This is also true of several other West European countries. What does official State recognition of Buddhism mean? Official recognition would allow Buddhists certain rights such as access to the media, financial support, legal standing, and recognition equal to those of Christian Churches, and right to teach in a school. It would allow them the legal right to form voluntary societies as exclusive Buddhist societies with membership restricted only to Buddhists. However, despite restrictive laws, there is growing public acceptance and accommodation of Buddhism in several European countries including UK, France and Germany. If we look at the world today we see powerful and influential organizations like the ‘Organisation for Islamic Cooperation’ and ‘World Council of Christian Churches’ who would stand by and publicly support the cause of their co-religionists unequivocally. Leading Buddhist organizations must do likewise. We must evolve mechanisms to help protect and save Buddhist communities and Buddhist Nations in danger. The protection and preservation of Buddhism must be placed high on the WFB Agenda. This is because it is Buddhism more than any other religion that has lost more ground and space to other religions during the last 1000 years. The WFB must take leadership in association with the Governments of Buddhism-friendly countries and other Buddhist organizations and Buddhist communities, in lobbying for greater official recognition of Buddhism by nations outside Asia. Buddhists in these countries are entitled to equal rights similar to those enjoyed by the followers of the Abrahamic faiths. (The writer is an Attorney-at-Law holds a Bachelor of Laws degree (University of Sri Lanka), and Master of Laws (Monash University, Australia). He holds a Diploma and Master of Arts in Buddhist Studies obtained from the Post Graduate Institute of Pali and Buddhist Studies, University of Kelaniya.